You are viewing the archived 2016 multigrain bread ratings. Follow the link to view the current multigrain bread ratings. Looking for the best multigrain bread to set you up for the day ahead? Compare brands of multigrain bread to see which are rated highest. 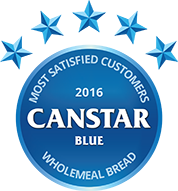 Canstar Blue research finalised in December 2015, published in January 2016. Only Bürgen scored top marks for taste and overall customer satisfaction. Australians clearly have a taste for multigrain bread, with 809 out of 3,000 survey respondents declaring it their bread of choice. And they certainly have plenty of options to pick from, with nine different brands featuring in our ratings. However, only Bürgen scored top marks for taste and overall customer satisfaction. As the name suggests, multigrain bread usually includes several different grains, depending on the type you buy. As such, it’s no surprise that consumers who purchase multigrain bread are much more likely to check the ingredients than those who buy other types – 52% compared to those who purchase wholemeal (45%) and white (23%) bread. You’ll find varieties of Bürgen bread, including Wholegrain & Oats, Fruit & Muesli and Pumpkin Seeds, in Woolworths and Coles supermarkets, with prices at the premium end of the market. At the time of writing, the brand’s 700g soy & linseed bread costs $4.90 at Coles. Canstar Blue commissioned Colmar Brunton to survey 3,000 Australian consumers across a range of categories to measure and track customer satisfaction. The outcomes reported are the results from customers within the survey group who have purchased either multigrain bread from a supermarket or grocer in the last three months – in this case, 809 people.